Thanks to our pals at Charles Chocolates, we're giving away four special chocolate treats for Easter: two 4-piece sets of chocolate Easter eggs and two 4-piece sets of fleur de sel caramels. To enter, just subscribe to our weekly e-newsletter. Or, if you already receive our newsletter, go to one of Chuck Siegel's three hot-chocolate recipes on Culinate — Hot Chocolate with a Milk Base, Hot Chocolate with a Water Base, or Hot Chocolate with Caramel and Cinnamon — and leave us a comment about one of your favorite hot-chocolate memories. *The drawing was held on Tuesday, March 17 — Congratulations to the winners:  Betty, Sherry, Alexa, and Sylvia. Thanks for joining in the chocolatey fun... and don't forget to take advantage of Chuck's special offer below before the March 31 deadline. 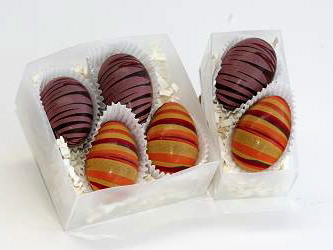 If you just can't wait, Charles Chocolates is also offering a 15-percent discount on orders made via their online store before March 31, 2008. Just enter the discount code "CULINATE" when ordering.